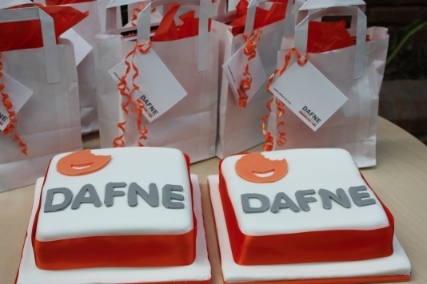 Below is the latest news from DAFNE Online - including stories related to the website, the DAFNE Course, and Type 1 Diabetes in general. If you feel you have a noteworthy news item, please contact us here. The Association of British Clinical Diabetologists (ABCD) launched their Lost Tribe campaign on the 8 November. The aim of the campaign is to highlight the differences between the types of diabetes and the fact that patients with type 1 have special needs which are easily overlooked because type 2 diabetes is so much commoner. In particular the campaign will suggest that people with type 1 diabetes deserve unhindered access to specialist care, when they need it, throughout their lives. Dr Helen Hopkinson, Chair of the DAFNE Executive Board said; "The UK DAFNE Collaborative is pleased to support the ABCD Lost Tribe campaign for people with Type 1 diabetes. We seek a central specialised commissioning process for structured Type 1 diabetes patient education that meets the NICE criteria. We believe this could end the postcode lottery that currently limits access to this vital component of Type 1 diabetes care for up to 50% of the UK." In case you hadn't noticed; we've had a facelift! Over the past few weeks we've been working on a new look DAFNE Online, and you can now see it! This will hopefully be a regular newsletter and all copies will be available on DAFNEOnline. I'm sure many of you will have missed the pun on the great track by Elvis Costello but cest la vie ! So if you havenâ€™t yet done a DAFNE course then follow the link !! After many requests and the work of Keith Clarke we are pleased to announce the launch of the DAFNEOnline Android App. You can get it here . It provides the same functionality as the iPhone app i.e the ability to sync your BG Diary with the site and the means to access the carb counting information. A big thank you to Keith for taking up the challenge and getting the app developed and released in a short time, after it had sat in development limbo ( mainly due to me, MarkE). After much blood, sweat and tears we have finally updated the UK handbook on the site to the current version. So all new graduates will recognise the handbook as the one they know, the rest of us can get familiar with the newest version. The only thing missing is the quiz at the end of the handbook that will be added in the next few weeks. The correction examples in the handbook are now 'interactive' in that the answers can be 'revealed' by clicking on a link. All our Kiwi Graduates will also be getting their own version of the handbook as soon as we can convert it to a web-format. This will hopefully not be in the too distant future ! In the spirit of positiveness that DAFNE nurtures UCLH is holding a celebration to mark 300+ graduates from the DAFNE course. We held a similar event last year when we reached 200+ graduates that was well received with good evaluation and a request for a repeat event. This is primarily a social event to give people the opportunity to catch up with other DAFNE grads and informally swap information. The renewal of contact with the graduates also serves as a reminder that the diabetes team are available as a resource should people wish to make appointments. A 'party bag' is given out which contains various bits and pieces on DAFNE, diabetes and a carbohydrate counting theme. Apologies to all those that could not access the site yesterday and could not upload data from their iphone. The issue is now resolved and everything should be working fine. Unfortunately being graduates ourselves we can't monitor the site 24/7 and so had to be told the site was down. I will try to get a 'backup' email address created so that people can email us if there is a failure in future. We have all been asked to take part in a Type 1 Diabetes survey. You can find out about it here and why you shoudl take part !